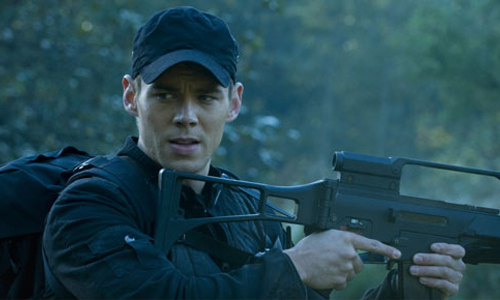 Cultural Wormhole: Stargate Universe - "Common Descent"
Lt. Scott (Brian J. Smith) checks out a new world on the other side of the gate. Finally, after several lukewarm episodes, 'Stargate Universe' delivers one that not only builds on material generated from within this series, but with some compelling ramifications. No communication stones. No mix bag of unrelated subplots. No ideas that would make more sense if I had watched the other two Stargate programs. This was more like it. Still, this was an idea that had been used before, most notably for me on a 'Star Trek: Deep Space Nine' episode called "Children of Time". In that episode, the DS9 crew got caught up in an incident that allowed them to meet their descendants that developed on a planet several hundred years ago after the Defiant crashed. It was a really great idea and a great episode. 'SGU' does a justifiable enough treatment of this theme that it can stand on its own. I think it's pretty obvious that the two clashing armies whose conflict led to the creation of the drone ships are the folks from Novus and Futura*. I'm sure that the reveal will be a big idea, but it will fall flat because the hint is so strong. Better to admit it and get it over with. *I loved the gag about Brody being the one to come up with the name of colony that followed Rush's ideas and the fact that Volker and Park ribbed him about it being a font. Speaking of Brody and Volker, both Peter Kelamis and Patrick Gilmore made appearances on this week's episode of 'The Killing'. The northwest must only have thirty character actors. I don't really have much else to write about "Common Descent" beyond the fact that I really liked it. This is the kind of episode that drew me into 'Stargate Universe' in the first place. Hopefully, this will be the story that the show can ride out for the remainder of the season as the series comes to a close.